A tropical cyclone has wrecked havoc across the Horn of Africa, leaving at least 15 people dead and tens of thousands displaced. Tropical cyclone Sagar, which means “the sea” in Hindi, formed in the Gulf of Aden between Yemen and northern Somalia late last week. Since landing over the weekend, the cyclone system has caused heavy rains in both the Puntland and Somaliland regions of Somalia, and moved along the coast to strike the tiny nation of Djibouti. With top sustained winds of 60 miles per hour, Sagar made landfall further west than any tropical cyclone in 52 years of record-keeping for the North Indian Basin. The cyclone, which is being called the strongest ever recorded in Somalia, left a trail of destruction including loss of livestock and crops and destruction of homes, as well as massive damage to infrastructure. “This is the biggest storm to hit the region in years,” Nigel Tricks, the regional director for the Norwegian Refugee Council said. The NRC said that at least 30,000 people were affected in Somalia and Djibouti. But the extent of the damage is yet to be confirmed, especially given the current armed conflict between Somaliland and Puntland that had already displaced almost 10,000 people prior to the cyclone’s arrival. 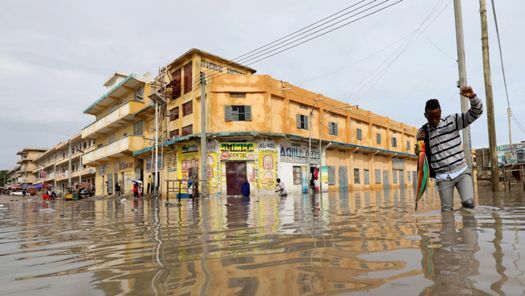 Torrential rains also pounded other parts of Somalia, with people and cars slowly moving through waist-deep floodwater after homes were inundated. Officials said the storm killed at least six people in the capital Mogadishu. The United Nations estimates 700,000 people in flood-affected areas will need livelihood support through September. Facebook activated a safety feature following the devastating floods. The flooding in Somalia comes just as countries including Kenya, and Ethiopia are recovering from the devastating drought that swept the Horn and East Africa region in the last two years. In Kenya, more than 170 people have died since heavy rains swept the country starting in March.